Let me first remind you of the context. A sea of stones between sea-and sea. Where somehow, some plants grow. Not many. And only on the lower levels. But they do grow. This Sea Beet plant plant in the picture above is about two feet across. 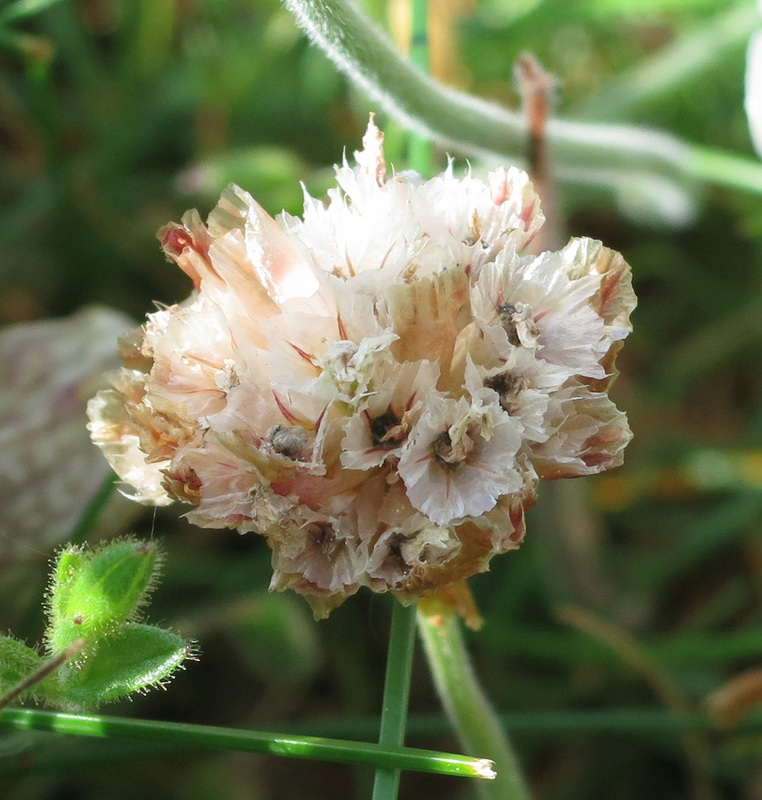 The focus of this post though is Thrift (Armeria maritima). In the foreground, Thrift. Further back - green patches where plants also grow. These in the picture are several feet across but some little islands of green are only twelve inches. Even in these small circles there are Thrift flowers in May. For an idea of scale - the dots are people climbing to the top of the beach. In the winter months of early 2014, this part of the world was specially storm tossed. Not only did great waves come over the top of the beach but tides came up higher than usual. The road that runs beside this part of Chesil Beach had to be closed from time to time because it was flooded. The extraordinaryness of this is hard to explain if you've never been here. And if you have . . . it is probably even harder to understand. For when you see where the sea is meant to be, it is . . . well it's terribly hard to believe that it can have come so far over its usual bounds. But come it did - up and over from one side and in on the tide from the other. So, to my mind, it's not only extraordinary that Thrift can make a mat for itself (along with other sea plants . . . and the odd dandelion that gets in on the act) and grow among pebbles, it's astonishing that it can make such an incredible display where everything has been thoroughly salt-soaked and under water. Here is an individual flower. 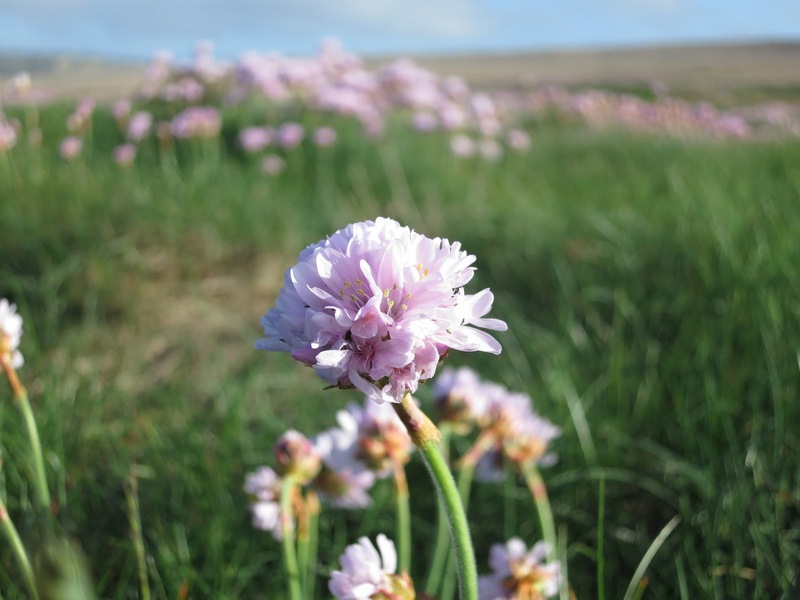 For those of you who have not met Thrift in person - they look very much like chive flowers. They stand five or six inches high. 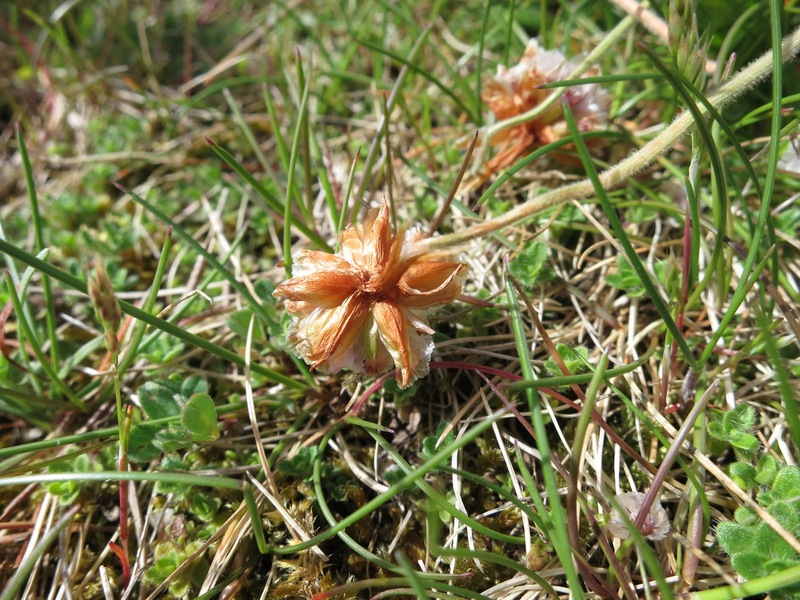 Their leaves are a mat of spikes; barely distinguishable from mown or cropped grass. This incredible flowering began in late April and has continued right through May. Now we are at the beginning of June the great expanse of colour has gone, even though there are still many blooms. Spent Thrift. June 1st 2014. But even dying flowers are lovely. And soon there will be seeds. These Thrift flowers were growing on the other side of the road - next to Portland Harbour. Here is the RHS page about Thrift. 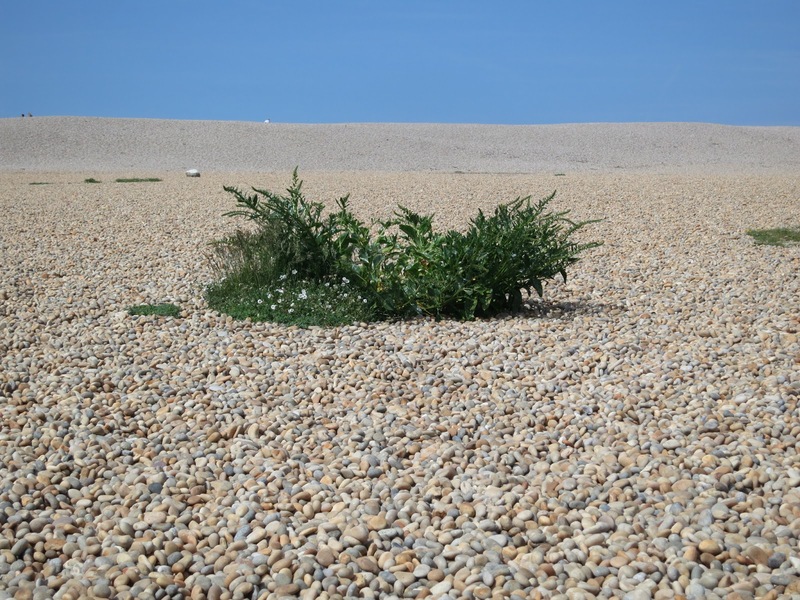 The description there suggests Thrift will grow almost anywhere - but . . . does it? 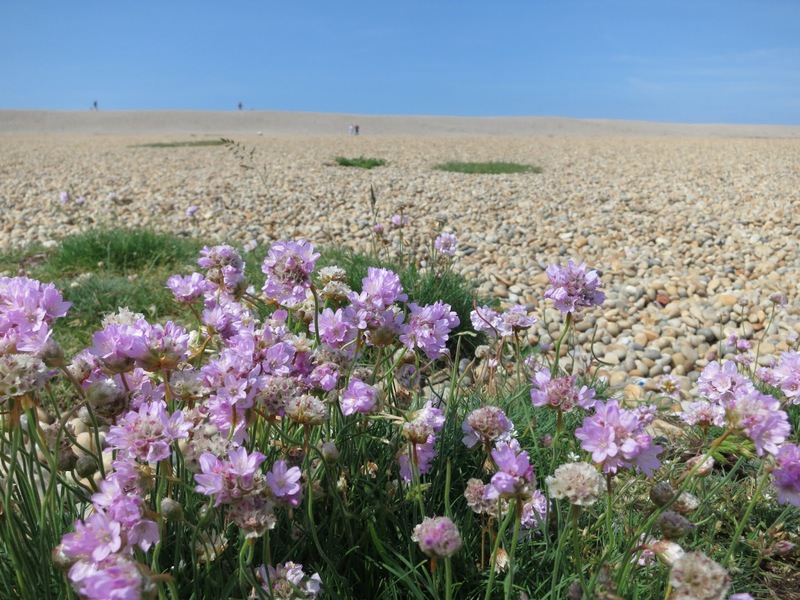 Lovely tribute and write up of the Thrift, such a resilient plant! Unlike the video clip which is quite terrifying! Hi, Mark and Gaz. Extraordinarily tough! But I wonder if it isn't more particular than the RHS page suggests because I don't remember seeing people cultivating it in their gardens. Or is this because it might be confused with chives or even purple clover? What do you think? Hello Rusty Duck. That wave is terrifying, isn't it! 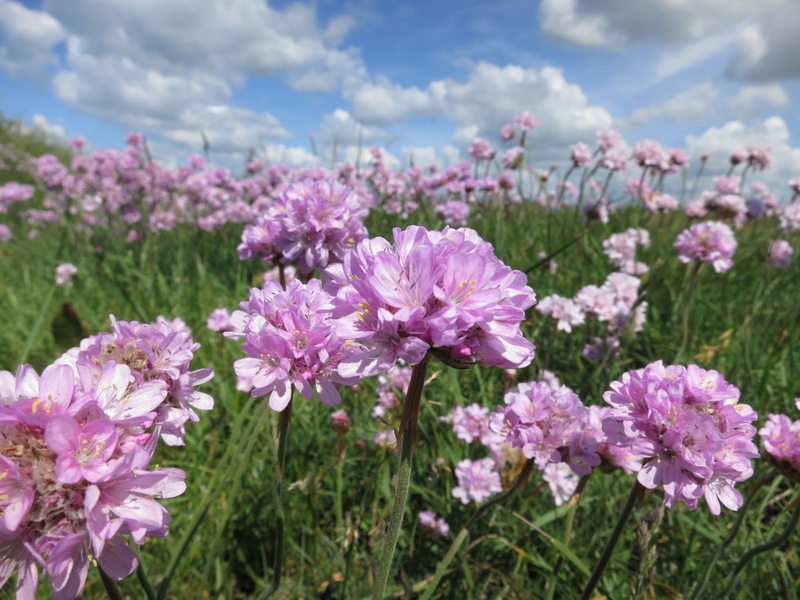 The field of thrift near Portland is just stunning! Thrift has always been a favourite flower of mine. A reminder of childhood holidays and clifftop walks. Hello Dartford Warbler. The astonishing thing is that the 'field of thrift' is only what's to see in that direction. There was more and more and more. Holidays:- thrift is a very holiday plant, isn't it? I don't know whether it figures in the Famous Five books - but that's the kind of place it belongs. I have heard of thrift but never seen it. Very interesting. Also interesting that everything could recover and bloom after the storms of last winter and the high waters. The resilience of nature! Wow, very pretty scenes. I love the field of the Thrift Flowers. I have never heard of them, they look lovely. Have a happy week! I remember seeing this all over Ireland and by the shore when I was there 10 years ago in May. Don't see it much here in the VA mountains. PS Our blog names are twin sisters! An especially beautiful post, Lucy. Thank you. My acquaintance with Thrift is from my boyhood days in Cornwall, where it grows profusely on the cliffs. I love it! Stunning place and photos, it looks like another world.. So want to see it for my self.. I did plant Thrift, love those flowers. Especially the field full of lilac. But mine ... seem to have forgotten to flower. Perhaps they'll be happier when they can smell the sea in False Bay? 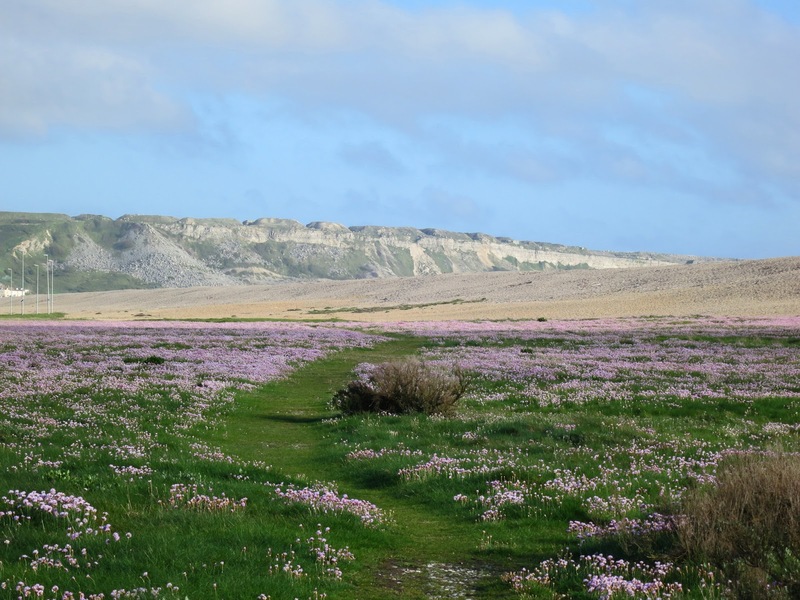 I have never seen thrift in such huge quantities - that "sea of thrift" view is magnificent. It even beats fields of lavender in the South of France! Beautiful photos! I especially like the one with the cliffs in the background. How stunning to see Thrift growing in its natural state......really beautiful and you get to see this gorgeous view in person.